How Often Do Kittens Poo? One or two poos a day keeps the veterinarian away. Kittens are so adorable, even their little poo piles make you go “awwww.” Well, not really, but those little steaming stinkers signify that your kitten is healthy and all the internal bits are working properly. The appearance of more, or entire lack thereof, could signal health issues. For very young kittens, counting poop episodes isn't easy because Mama handles this nasty, yet important chore herself. Kittens younger than 4 weeks old cannot go to the bathroom by themselves, and are only stimulated to do so by Mama's tongue. After they nurse, Mama gives them a little bath and pays particular attention to their nether-regions. The feel of her wet, warm tongue triggers the kitten's urge to go, and Mama cleans up the result. By the time your kitten is about a month old, he graduates to controlling his own bowel movements and can make the transition to the litter box. Here's where you can keep better tabs on his poo deposits. The average kitten usually poops once or twice a day, although every kitten is different and things like his diet and fluid consumption may alter his regularity. If he's still taking milk, either from Mama or a bottle, his poop is usually firm, well-formed and looks brownish-yellow. Kittens who've transitioned to solid food typically have darker brown poo, but it should still not be too mushy or too hard. You're looking for the consistency of mashed potatoes. Pooping more than once or twice a day doesn't necessarily mean there's a problem, as so long as it's still well-formed and looks healthy. The problem arises when the poo turns to more of a liquid consistency, usually accompanied by an unusual color change. This indicates your kitten isn't feeling well. Because of their size and immature immune systems, diarrhea in kittens could result in more severe health concerns, specifically dehydration. If your kitten suffers from diarrhea for more than a day, contact your veterinarian. You may need to gather a stool sample and take it in for testing. Most kittens suffer from diarrhea due to parasites or infectious problem, which are easily conquered with the proper medications. On the flip side of diarrhea is the complete lack of poo – constipation. This shows as either no poo at all for days at a time, or very compacted, darkly colored lumps when your kitten finally does go. This typically happens after kittens have weaned from their milk, as the all-liquid diet offers enough hydration to make good poo. Offer your kitten fresh, clean water at various locations around the house to make sure he drinks often. Cats in general love flowing water, so you could look for a fountain-type water dish that keeps circulating the water. It entices the kitten to drink more often. Your kitten could be learning picky habits, so keep the litter boxes extra clean by scooping every day. Offer a moist diet in addition to or in place of his hard food to get a little extra moisture into him. If nothing seems to work, see your vet for help. CatChannel: I'll Just Ask: How Often Should Cats Poop? 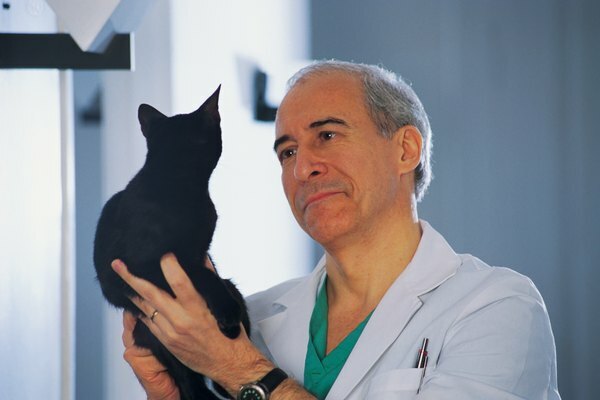 CatChannel: What Causes Kitten Diarrhea? Do You Stimulate Kittens to Go to the Bathroom Before or After They Eat? How Much Should Kittens Drink? When Are Kittens Ready to Eat Solid Food? How Often Do Cats Urinate Per Day? What Color Should a Kitten's Stools Be? Do Baby Kittens Sleep a Lot?